A few months ago my book, The Gospel in Ten Words, joined an exclusive club of books that have received 100 five-star reviews on Amazon. In recognition of this achievement, Amazon sent me a gold-framed certificate, a gift voucher, and a personal note from Amazon CEO, Jeff Bezos. Actually, none of that happened. But it should have. Come on Amazon. Get with the program! Anyhoo, the 100 five-star reviews prompted two thoughts. First, it reminded me of how grateful I am to all of you who have taken the time to post a review of my book on Amazon. You guys made this happen, so thank you! Second, and in the hopes of promoting the message of grace, I thought it might be fun to see what other grace books had received 100 five-star reviews. So I did something I haven’t done for far too long – I made a list. Inevitably, I had to make some judgment calls. For instance my list excludes some excellent grace-based novels like The Shack and the classic children’s book You Are Special. But the list does include the partly-fictional book The Cure. My list also excludes classics like Spurgeon’s All of Grace and Gillham’s Lifetime Guarantee – books that were first published long before Amazon reviews came along. On the other hand, I decided to include books that say little about grace but a lot about God’s unconditional love (eg: Wayne Jacobsen’s He Loves Me). My thinking is that if you know the unconditional love of God you know about grace. To my surprise, the final list was small. Just eleven books (see below). But the list is surely incomplete. No doubt I have missed some books. This is where you come in. If you can think of any books that meet the two criteria above, let me know and I will add them in due course. I expect this list will grow and I plan to update it each year. Why did I compile this list? Ultimately I wrote this list to encourage you to read the books on it. 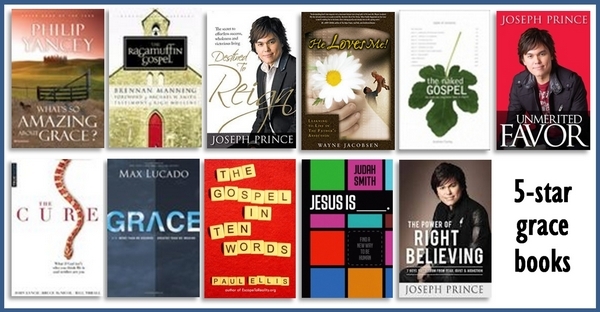 All of the books below will help you grasp the good news of God’s unconditional love and grace. All of them will bless the socks off you. Now, i can stock my GRACE library, thanks. Have you heard of the Prophet Kobus Van Rensburg? He was an off-da-hook Grace preacher who passed on last week. Thanks once more, have an awesome 2014. I really appreciate you taking the time to tell us about your exciting journey towards grace. I have posted your whole story over on our Grace Stories page where the word limits are less restrictive. Check it out. I am busy working my way through this list of recommending reading. All good choices it seems. Almost done with “The Power of Right Believing”. When done then to get started on “….20 questions”. Gotta throw in some of Wommacks books for reading however. I really love this message of Grace. I am stunned and totally gobsmacked to NOT see Grace, The Power to Change by J B Richards on that list. That was the book and he was the preacher who started it all, back in the late 1980s. How quickly they forget. Thanks LJP! Happy New Year to you. And thanks for being one of E2R’s top 5 commenters in 2013. Keep ’em coming! Cool, thanks! It’s always a pleasure to gain new insights from your posts and all of the great comments that come in. Happy New Year to you and your family as well. Hi Paul, I have benefitted immensely from your “10 Words” and this blog! As a believer who has spent a significant time in both the Arminian and Calvinist camps I am thrilled to see this convergence of grace going on. It seems that it is bringing unity to the Body as both continue to boldly embrace the incredible Gospel of freedom! Thanks Kate, for your feedback. As it happens, I have just written a review for One Way Love and plan to upload it in a few weeks. I felt about it as you do – it’s excellent on the love of God but a little confusing when it says we are 100% righteous and 100% sinful. That said, I would not hesitate to add the book to the list above once it reaches 100 5-star reviews because the confusing bits are few while the call to rest in Christ’s finished work is clear and unequivocal. Would you agree? Absolutely, we must endorse the truth coming from these theologians! I praise God that there are more and more strong voices proclaiming God’s grace/unconditional love. I am curious about the above list. I have read maybe half of the titles you mention. Which ones are clear about the new nature of the believer (besides you and Prince)? If you’re looking for a book on our identity in Christ, I would recommend a book that in’t (yet) on this list: God’s Astounding Opinion of You, by Ralph Harris. It’s excellent. I appreciate the book tip…I just downloaded it on my kindle. Looks like a great book and timely to read right now. Thanks! 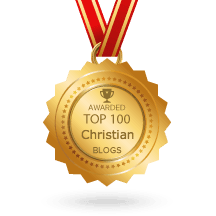 Have you thought of Tim Keller’s “The Prodigal God”? He’s been Tchividjian’s mentor over the years. His book has 350+ five star reviews. No, I hadn’t heard of that one. If a few others recommend it here, I’ll definitely check it out. The book by Jeremy White ” The Gospel Uncut: Learning to rest in the grace of God” is superb!! Explains a lot of things in Scripture too. 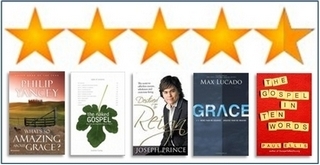 Helped me as much or more as all the other high rated Gospel books on grace and God’s love. which I love too. Also the book by Dan Stone : “The rest of the Gospel when the partial Gospel has left you worn out.” Not done reading it yet but very blessed and encouraged by it so far. SOO happy these kinds of books are coming out more now, or in the last few years. Had been, still a little afraid to read the bible except for Daily Light on your daily path because of a lot of verses that would put me in shock. I tend to take things literal right away. I have both your books Paul and have been reading up on your website on Scriptures etc.. and they have helped me a lot!! Along with the books I just mentioned. Hi Rosa, I’m so glad you have benefited from Jeremy’s good book. Thank you , and then I emailed him and asked if he could recommend any other good books to read and besides Andrew Farley’s books and Andrew Nelson’s( I haven’t read them yet) he mentioned yours. GITW. So glad he did. Your book is also on Ralph Harris recommended reading list. That’s how I found out about your website. And after reading some of it got the book and now also GITQ which I’ve just started. Joy, go with your Holy Spirit-given intuition. The Shack struck a chord among millions even if the writing wasn’t par with certain standards out there. It was because of its core message. What you learned about our Papa God is worth everything and don’t let a critic take a grain of that away from you. The truth of your Abba Father resonates with you because it reflects, and yet is infinitely deeper than, the love you have for your own children/family. Thank you for sharing your thoughts about The Shack–you are right, it dispels the 2 lies that fuel all religion: distance and delay. Regarding the revelation of the Trinitarian life of God, again you were spot on how important and vital that is! Yes, it makes Him personal. Also it reflects the theology of the early church notably one named Athanasius who wrote the Nicene Creed. Someone named Dr. C. Baxter Kruger wrote a book in 2012: “The Shack Revisited: There Is More Going On Here Than You Ever Dared to Dream” that expounds on the deep and profound theology found in The Shack. So glad you were blessed by this book. I’m sorry to take issue! I think that ‘The Shack’ is a horrible mess and as such an embarrassment to the wider Christian community. Actually, I’ve never read a Christian novel that is in any way of some literary quality, which is a crying shame given that good writing could be a great vehicle to spread the gospel. (Exceptions: ‘Quo Vadis?’ or maybe ‘The Cardinal’, which is primarily cheesy so probably wouldn’t make the list anyway … ;-)). Also, surprised that Philip Yancey tops the list. I love his books but I don’t think he’s a grace writer. For example, in his book on prayer there is a whole chapter dedicated to why God doesn’t want everybody healed and how illness can be a blessing. For me this is no minor quibble – if God isn’t all good and all gracious, this taints the message. ‘Destined to Reign’ – now we’re talking. Shame about the off-putting self-helpy cover and title – it’s the most solid, convincing theology I’ve ever read, very easily in a league with Martin Luther. A book that helped clarify and solidify my understanding of grace is Clark Whitten’s, Pure Grace. Looking forward to diving into a few on your list. Blessings in 2014! I’ve just finished reading Pure Grace and will post a review probably next month or so. I agree – it’s a good read! Have you read Paul White﻿ book Between the Pieces﻿? It’s pretty good. I haven’t, not. In fact, I hadn’t heard Paul White had released another book. I have read Revelation to Transformation and enjoyed that very much. Thanks for letting me know. Anybody read Jerry Bridges, Transforming Grace? I haven’t read it just wondering. My friend wants to read it and talk about it together. I have read Transforming Grace . Picked it up at the thriftstore once. One of my very first total grace teachings. A gift from God it really was. Me too! One of my first read books on amazing wonderful grace! Paul, thank you so much for your blog and book recommendations.. I love all of them.. I would like to recommend a book, it’s not openly talking bout grace but of love..
Love Does by Bob Goff.. It doesn’t talk bout grace but the love showed, now that’s the heart of God himself..
Oh yes, and Paul your blog was a Godsend when i was in Cemetery, sorry Seminary.. hehe..
Grace Walk is on the official list, just not the original list above (which was compiled in 2013, before it had met the threshold). The official list is bigger than the one you see above. Hi Paul, Thanks for compiling this list. It sure is useful to me. For a long time I never saw the Old Testament as a grace book, I could only think of the New Testament as God’s grace book. But praise God after He opened my spiritual eyes, I fell deeper in love with His amazing grace visible all through the Old Testament. What an amazing God we have who is so madly in love with us!